The Witchwood may be treacherous, but it isn’t quite done pulling tricks out its sleeve. Starting today players can to jump into the Monster Hunt, a free, single-player mission for Hearthstone’s latest expansion. For players that were fans of the Dungeon Run in Kobolds & Catacombs, the Monster Hunt should feel a little familiar. But there are some changes in The Witchwood that should make the experience unique. In Kobolds & Catacombs, you choose to play one of Hearthstone’s nine classes. But while Hearthstone’s heroes may be effective in dungeons, you’ll need someone with more experience in The Witchwood. Instead of those heroes, you’ll be playing the role of one of four new heroes. As veteran monster hunters, each has a special ability suited for taking baddies down. With each hero, you’ll face down eight bosses, including a special nemesis — a boss unique to the hero you’ve chosen. The four special heroes are Darius Crowley, Tess Greymane, Houndmaster Shaw, and Toki, Time-Tinkerer. Lead Mission Designer Dave Kosak took over the latest Hearthside Chat to talk about the new single-player mode in detail. Along with Kosak, Mission Designers Paul Nguyen and Giovanni Scarpati hop in as well. Together they discuss the new heroes, and new enemies players will see in the missions. Players will need to master each new hero’s special abilities to succeed. The new hero powers sound particularly interesting — especially Crowley’s cannon fire ability. You start the match with an indestructible cannon, but that cannon only fires at what’s directly in front of it. It sounds like a pretty unique and fun game of positioning — sort of like playing chess in the middle of a Hearthstone match. That’s not going to be frustrating at all, is it? Don’t limit yourself to just one hero, however. Each hero offers you a quest, and completing the quest will earn you a Witchwood card pack. 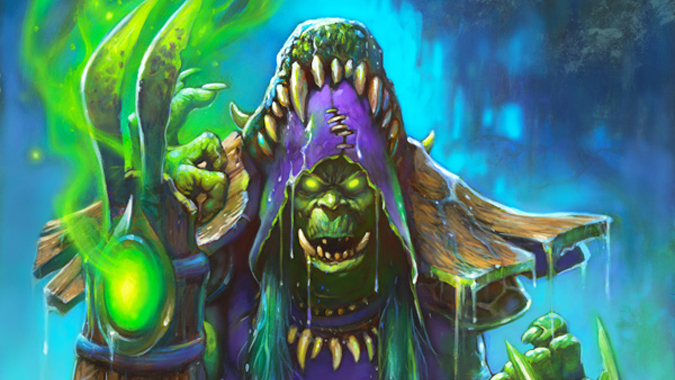 But you’ll need to clear the Monster Hunt with all four heroes to unlock the final boss — Hagatha the Witch. If you manage to successfully defeat Hagatha, you’ll earn the Monster Hunter card back.